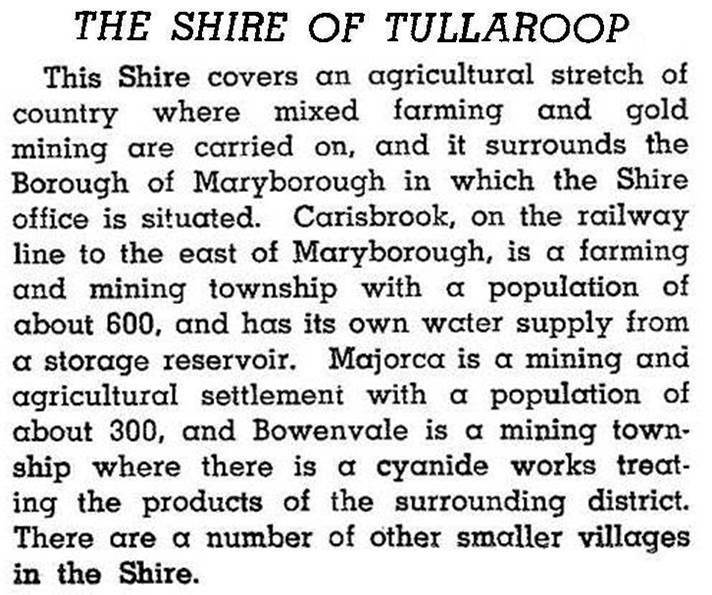 Tullaroop Shire (1865-1995), an area of 638 sq km, was a municipality which surrounded Maryborough city, about 130 km north-west of Melbourne. It was proclaimed on 24 January 1865, and also excluded the Carisbrook and Majorca boroughs until they were united with the shire on 1 October 1915. The name is thought to be derived from an Aboriginal word meaning swamp thistles. The Tullaroop Creek flows northwards through the former shire, joining the Loddon River at Eddingtion, which was on the shire’s northern boundary. Much of the shire included goldfields that were discovered in the 1850s and were worked as deep leads until the 1900s or shortly after. Notable goldfields were the Alma-Bowenvale leads, the Craigie-Majorca leads and the Havelock leads. The agricultural townships were Carisbrook and Eddington. Railways crossed the shire south-north and east-west, intersecting at Maryborough, along with the Pyrenees Highway which is also east-west. The Laanecoorie Reservoir was built on the Loddon River in 1890, just north of where the Tullaroop Creek joins the river at Eddington. In 1959 the Tullaroop Reservoir was built upstream near Majorca. It holds 74,000 megalitres, about four times Laanecoorie’s capacity. The shire’s administrative centre was Maryborough. On 19 January 1995, most of Tullaroop shire was united with Maryborough city and most of Bet Bet and Talbot and Clunes shires to form Central Goldfields shire. The balance of Tullaroop was absorbed by Loddon shire. In 1994 71% of Tullaroop shire’s area was used for farming, on which 129,000 sheep and lambs and 4000 cattle were carried.